Took this near the station, where I dropped off a Stansted-bound daughter recently. 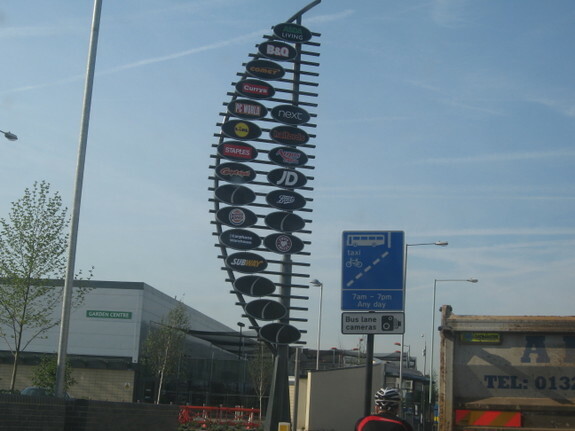 I'm not a purist about purpose-built shopping complexes, but something about Tottenham Hale's depresses me. The signage seems to provide the one point of originality. All I know of Tottenham Hale is that it used to house GLC Supplies, which supplied stationery to schools in London. Dave, see, you have a keen eye for your surroundings and it matters to you if they are beautiful or ugly. In that at least, you must admit, Boris Johnson has the edge over Ken. Boris has a very keen aesthetic sense and that is one of the reasons I suppport him. Angela, I agree that Mayor Johnson's policies on culture and buildings/planning contains promising elements and I'll be following developments with great interest and an open mind. So far, Boris's policy on Planning has been to abrogate all responsibility and allow Ian Clement to pass *all* planning applications, unopposed. Again there's an incoherence here - as a libertarian Conservative who believes in private enterprise and the free market, Boris comes from the tradition that brought us out of town shopping centres and retail parks and other excresences - can't stand in the way of business, why should the nanny state tell a freeborn Englishman what he can do with his land and money? I'm not sure how Boris intends to weld that into a new Golden Age of architecture frankly - giving planning powers to the boroughs puts them back in the unholy local alliance of permanent Tory majorities working in cahoots with local business, in many areas. Anyway, modern architecture is, amazingly, going through a not-too-ugly-at-all phase, and some of London's modern buildings are very fine looking indeed.